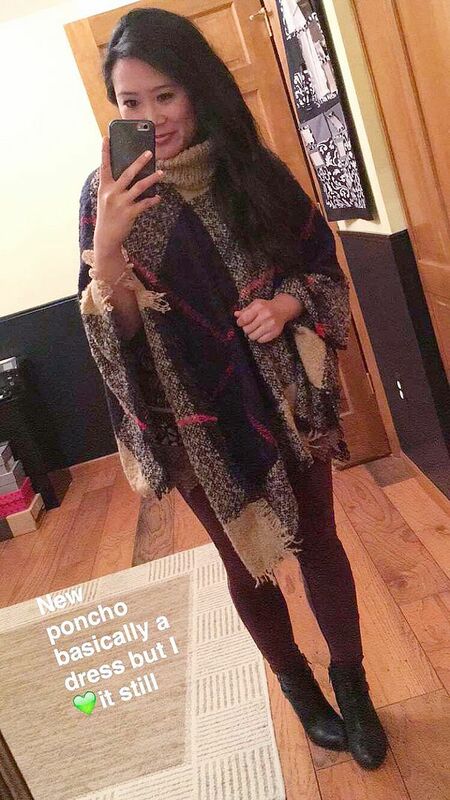 Lately I've had a huge crush on ponchos, and I fell in love with this one the second I saw it online. I loved that the print was mixed with navy instead of black. 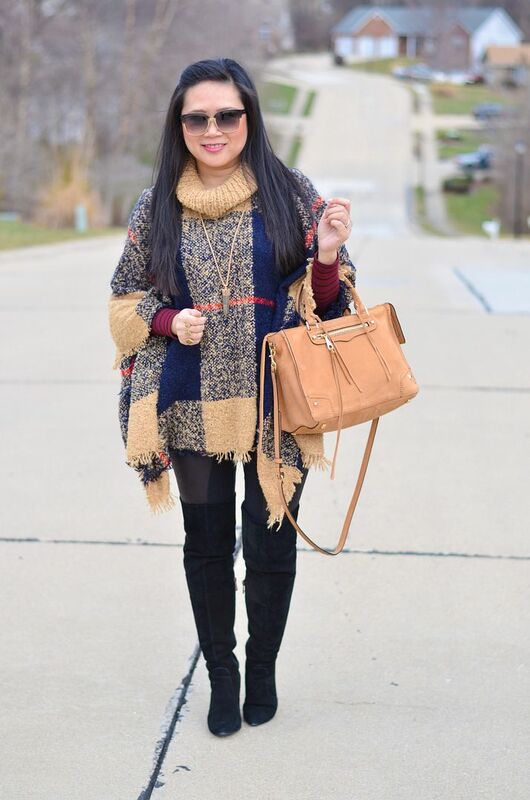 I also loved the cowl neck and the chunky texture. It was backordered for a bit, but arrived last Friday and I was super excited to try it on. Based on how it looked on the model, I didn't think it would be *that* long on me. Long, but not ridiculous. If you follow me on Snapchat, these images should look familiar to you. The poncho doesn't have any arm holes, you literally just stick your head through the neck hole and you're done. So, I was a bit discombobulated when I first tried it on. I thought I was putting it on straight, but apparently I had it turned just a bit and the poncho ended up being the perfect length vs. the dress length that I originally thought it was! I blame the glass of wine I had at dinner! After I saw these photos, I decided that next time I wear them, I will just skip the OTK boots and go with some booties. 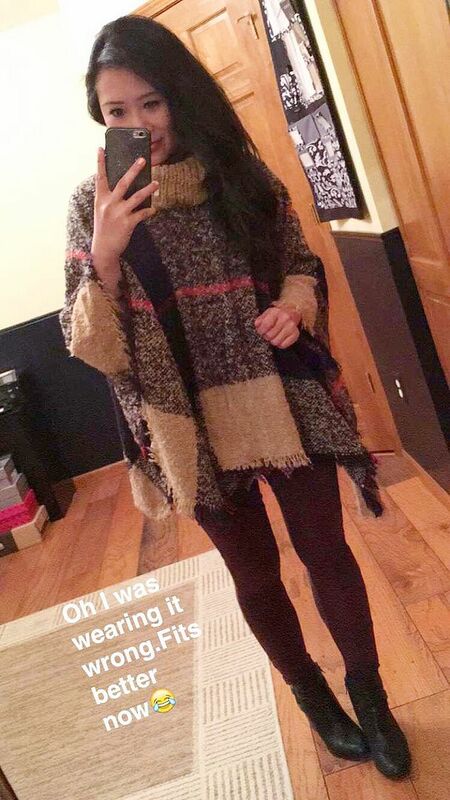 Looking at the Snapchat photos, I just felt like my legs looked a lot longer with the booties + poncho combo. 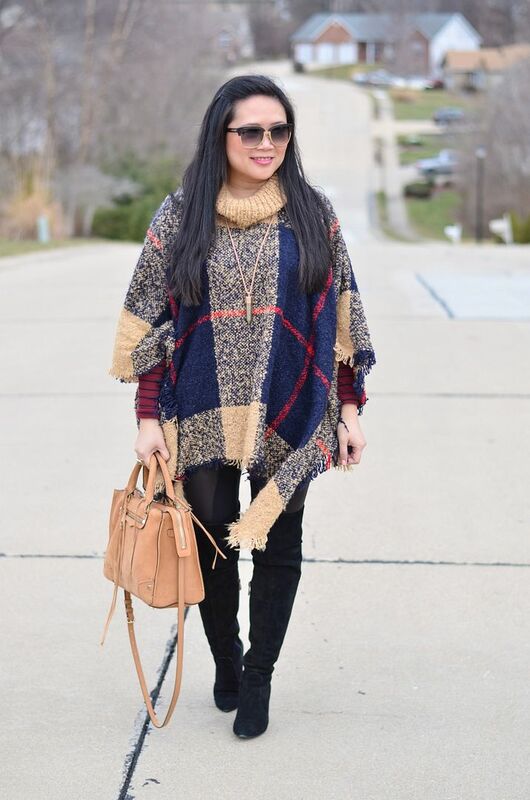 Regardless, ponchos and capes are definitely an acquired taste and I think I've definitely crossed into the "love them" bucket. 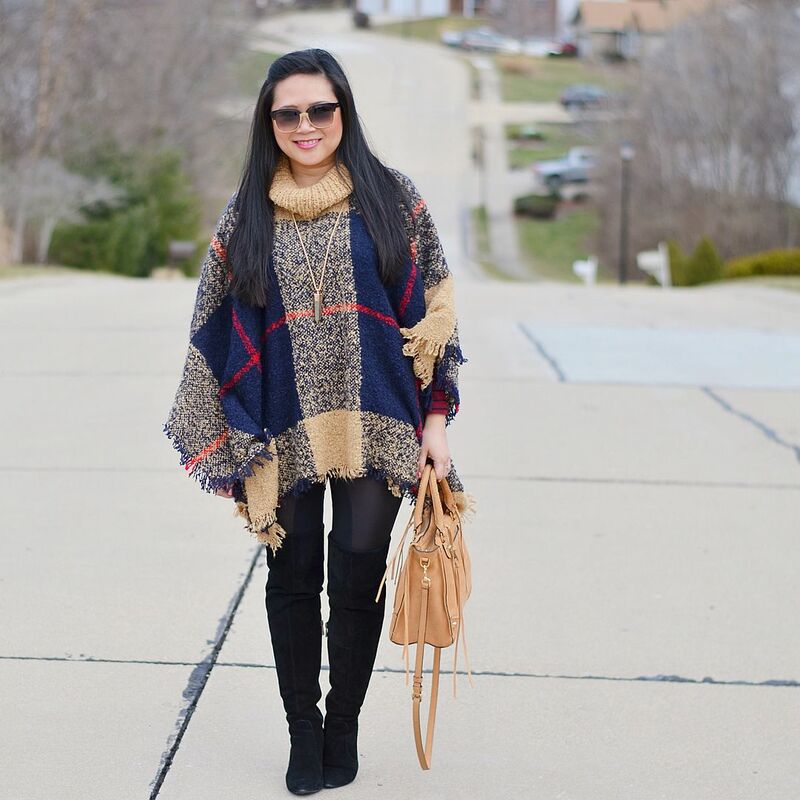 I'm not going to be adding a ton of these to my collection as I already have a handful and they're such a trendy piece, but they definitely come in handy when you just want to throw something on and be both comfy and warm! Such a lovely piece and it looks amazing on you! I don't have any ponchos, just never got into them. They do look better with booties, and extremely cozy. 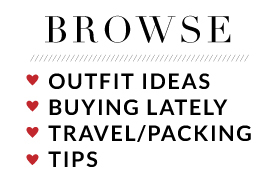 I do, however, think you were very clever to ensure that your leggings matched your boots because your legs? They appear to go on forever :) which always a lovely thing. I like the idea of ponchos but I feel like they dont look great on me. 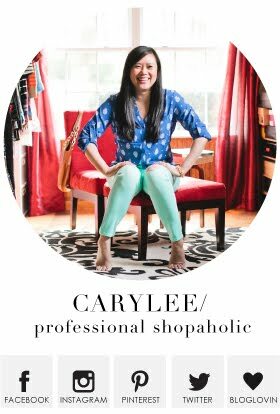 They definitely suit you and those boots are amazing, Caryl! 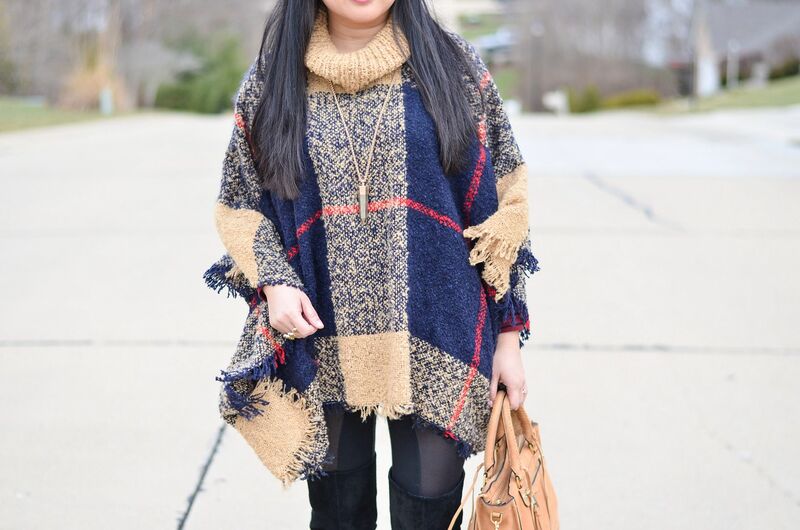 I love that this poncho is so flattering on you! I often feel like they swallow me whole, but this one looks so good!! They are just always so comfortable. I think it looks fine with the OTK boots, but booties would be cute too! LOL I have totally worn a poncho and cussed it out because I was like Wtf how do I wear you?!?? !